Growing up, I loved the Smurfs! When I was a little girl, I had a Smurfette pillow that I carried around with me everywhere. Saturday mornings always included these small blue creatures. It sure is fun to be able to share them with another generation. Leave a comment below that answers: Which Smurf is or was your favorite? Please use a valid email address, this is how I will contact the winners. Giveaway will end at 8:00pm PST on Tuesday August 16th. ONE winner will be chosen randomly using â€œAnd the Winner Is:â€ a WordPress plug in. Good Luck! 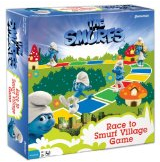 Giveaways Aug 10, 2011 in games, kids, Smurfs, toys · Expired!